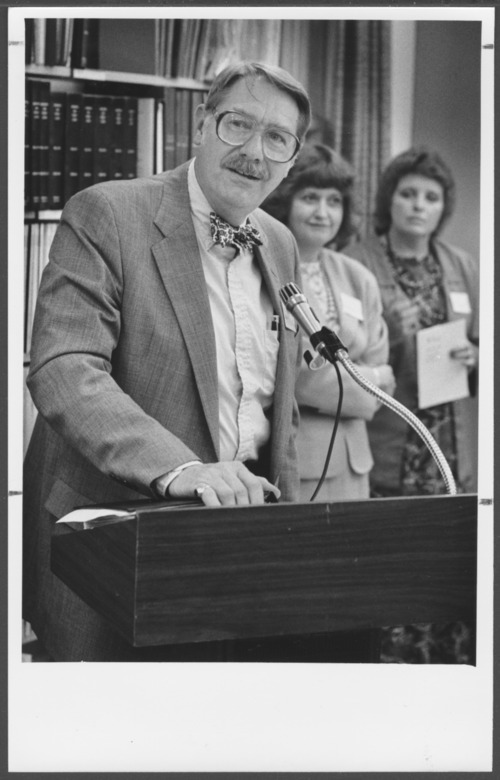 This photograph shows Dr. Walt Menninger, CEO of the Menninger Clinic, at the annual author's reception honoring the many Menninger staff members who published articles and books. Dr. C.F. Menninger and his sons, Dr. Karl and Dr. Will, founded the Menninger Clinic for mental-health treatment, education, research, and prevention in Topeka. Dr. Bob, son of Dr. Karl, and Dr. Roy and Dr. Walt, sons of Dr. Will, continued in the leadership of the Clinic.